Summary and Definition: The Tlingit were a seafaring people, skilled fishers, traders and hunters-gatherers, who were located southern Alaska in the United States and British Columbia and the Yukon in Canada. The Tlingit tribe, whose name means "People of the tides" lived off the produce from the Pacific Ocean and surrounding coastal areas. Their shelters were plankhouses built from the abundant Cedar trees which also provided the material for their dugout canoes. Tlingit Totem Poles symbolized guardian spirits who watched over the family, clan and people. This article contains fast, fun facts and interesting information about the Tlingit Native American Indian tribe. Find answers to questions like where did the Tlingit tribe live, what clothes did they wear and what food did they eat? Discover what happened to the Tlingit tribe with facts about their history. The Tlingit people were organized into settlements and communities, rather than tribes. Tlingit society was multi-layered involving social classes, kin ties, and territorial units. 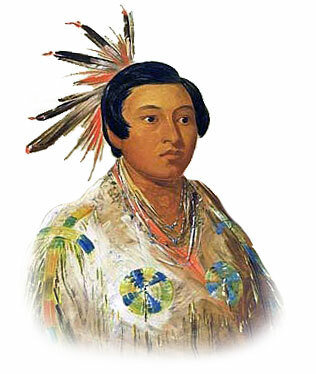 The Tlingit were divided into eighteen great families, with the name of wolf, bear, eagle, whale, shark, porpoise, puffin, orca, goose, beaver, owl, sea-lion, salmon, orca-bear; raven, frog, dogfish and crow. The Tlingit people were not allowed to marry into a family with the same animal name or totem. The totem posts erected outside their houses reflected the animal totem of the family. Tlingit villages were located in a sheltered bay and where their houses faced the sea. The beach in front of the Tlingit village would be covered with canoes dragged up on the sand together with fishing tools and fish racks. When a Tlingit found himself in a strange village, his first task would be to examine totem posts to find one that bore his own animal totem, knowing he would be welcomed by the occupants. The four social classes of the Tlingit tribe consisted of royalty, the nobles, the commoners, and the slaves. Children born to slaves were also considered as slaves. Many of the Tlingit people decorated their face and bodies with tattoos, others pierced the lower lip for the wearing of a plug as an ornament. One of the most common traditions of the Tlingit Tribe were the Potlatch Ceremonies which enabled the host to acquire or maintain prestige within their community. The Tlingit were one of the tribes of Northwest Indians who erected Totem Poles. Totem poles were carved with animals that symbolized their guardian spirits. The names of the other tribes who made Totem Poles included the Haida, Chinook, Bella Coola, Tsimshian and the Coast Salish. Where did the Tlingit tribe live? The Tlingit are people of the Northwest Coast cultural group. The location of the Tlingit tribal homelands are shown on the map. The main territories of the Tlingit tribe were the mainland coast, islands, and bays of southeast Alaska, British Columbia and the Yukon in Canada. The geography of the region in which they lived dictated the lifestyle and culture of the Tlingit tribe. 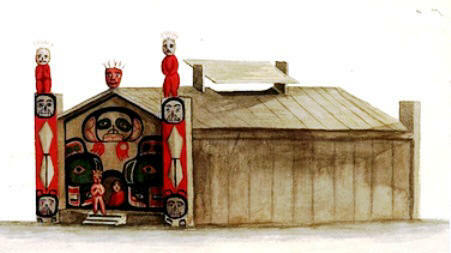 Tlingit Plank house: James G. Swan, 1874 painting of a Tlingit plankhouse model from Sitka, Alaska. What did the Tlingit live in? The Tlingit tribe lived in rectangular plankhouses with four main house posts and distinctive sloping roofs. They were built from the red cedar trees or from fir or spruce trees and painted with signs and symbols of the family and clan. Totem posts were erected at the sides of the plankhouse. The Tlingit plank houses were measuring about 40 or 50 feet long. There were no windows in the Tlingit plank houses but there was a central fire pit with a centrally located smoke hole, protected by a plank screen, that let fresh air in, and smoke from cooking fires out. The plank houses held 30-50 people, usually of one main clan. The interior was lined with plank floorboards and had a central hearth and common working area with tiered wooden platforms that were separated by wooden screens and storage boxes. What language did the Tlingit tribe speak? The people spoke in their own Tlingit dialect, an Alaskan language distantly related to the Athabaskan languages. The Tlingit tribe believed that a creator god,called Kah- shu-goon-yah, made the universe and controls its fundamental features. Raven, a Trickster god, taught the Tlingit people the institutions by which they lived. The jek, or supernatural spirits, are found in almost anything. The jek could confer on people healing powers, wealth, war powers, and ceremonial status. The Tlingit believed that every person possessed a mortal and an immortal soul, and when they died, if morally worthy, they ascend to Kiwa-a, the highest heaven. Those that had led evil lives would be condemned to Dog Heaven, where they would be punished. The Tlingit also believed that, in time, all souls returned to the living through reincarnation. The tribe are strongly associated with Totem Poles. Wood carving, usual painted, was the outstanding art of the Northwest Coast tribes. The Tlingit artists carved grotesque faces of animals, birds, mythical creatures and people on storage boxes, house fronts, house posts, boats, and grave posts. They also made wooden masks for the ceremonial dances and dramatic performances. The grotesque masks were also used during wars and conflicts. The Tlingit also used the Chilkat weaving technique, which had spread throughout the Northwest coast tribes. Mountain-sheep wool and mountain-goat hair was woven to create striking designs featuring symbolic devices. Chilkat weaving was applied to creating blankets and clothes including tunics, leggings, robes and shirts. A feature of Chilkat clothes was a long wool fringe. 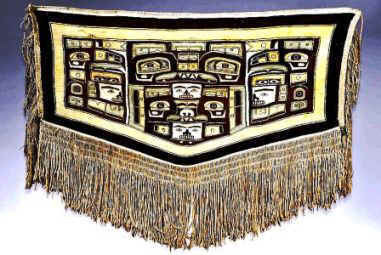 Wall-hangings were also created using the Chilkat weaving technique. Chilkat clothes was worn by dancers during Tlingit rituals and ceremonies. Traditionally the Tlingit chiefs would wear Chilkat blankets during potlatch ceremonies. What clothes did the Tlingit wear? The clothes worn by the Tlingit were similar to those worn by the Chinook Tribe - please refer to this article for comprehensive information about Northwest clothing. There were, however some differences. Many of their clothes and blankets were made by the Chilkat weaving technique. They men also wore a moccasin style shoe during winter hunting trips, whereas the tribes in the southern regions of the Pacific coast went barefoot. The Tlingits also wore wore basketry hats made of finely woven spruce root and bear grass. The designs and patterns of these hats often displayed a person's status and family connections. The Tlingit canoe builders hollowed logs with fire to make the canoes they paddled in the rivers as well as the big seagoing whaling canoes. Some of the canoes were large enough to carry 30 to 60 people. The Tlingit dugout canoes were often carved and painted at the ends. The paddles used for driving these canoes were slender and long-bladed, and also painted with symbols and designs. The lightweight canoes were perfect for travel along fast streams and shallow waters and were sturdy enough for the rough waters of the bays and of the Pacific Ocean. The Tlingit were one of only 6 tribes of Northwest Coast Indians (Bella Coola, Haida, Kwakiutl, Tsimshian and Nootka) who erected Totem Poles made by carving and painting vertical logs. Totem Poles symbolized guardian spirits who watched over the family, clan, or tribe. Totem pole designs follow a distinct style. The Tlingit, Haida, and Tsimshian use the "Northern Style", which utilizes identifiable color schemes of red, black and turquoise. The "Southern Style" of Totem Poles is common to the Bella Coola and include impressive thunderbirds and crest figures using an intricate color scheme favoring black, red, green, and yellow, white and turquoise colors. The picture of the Tlingit funerary totem pole was raised in Pioneer Square in 1899, after being taken from a Tlingit village in Alaska. For additional facts and information refer to Totem Poles. The Tlingit Totem poles were erected at the side of a plankhouse. What food did the Tlingit tribe eat? The food that the Tlingit tribe ate included their staple diet of fish supplemented by wapato (Indian Potato) greens, seeds and berries. The women also pressed the rich oil from the eulachon (candlefish) and used large amounts of this oil as a dip for their food. What weapons did the Tlingit tribe use? The weapons used by the Tlingit included bows and arrows, clubs, harpoons and spears. They also used wooden slat armor and wore masks designed to terrorize their enemies. The Tlingit were believed to have settled in the region for thousands of years. The first recorded contact by Europeans with the Tlingit people started in 1745 when Russian traders started to explore Alaska. The Russians initiated trade with the Tlingit for sea-otter pelts and other items. By 1772 the Russians had established permanent settlements and trading posts in the area. Although initial contact with the Russians was peaceful the culture clash soon led to conflicts and wars. In 1794 the first Russian Orthodox missionaries arrived from Russia to convert Alaskan Native Indians and in 1799 Russian claimed the whole of Alaska for themselves. In 1804 the Battle of Sitka, was fought between European and Alaska Natives and in 1805 the Tlingit attacked and destroyed the Russian post at New Russia. In 1835 the United States and England obtain trading privileges in Alaska. Contact with the Europeans brought sickness and disease to the Tlingit. Between 1835-1839 epidemics of smallpox, measles, chicken pox, and whooping-cough epidemics ravaged their communities. In 1838 the British Hudson’s Bay Company leased the Southeast Alaska mainland from the Russians. In 1867 Russia sold Alaska to the United States for for $7.2 million. Modern day Tlingit people have communities including those at Craig Reservation: State, under the jurisdiction of Prince of Wales Island, Hoonah Reservation, under the jurisdiction of Chicagof Island, the Kake Reservation under the jurisdiction of Kupreanof Island and the Klawock Reservation, under the jurisdiction of Prince of Wales Island. The Tlingit Tribe was one of the most famous tribes of Native American Indians. Discover the vast selection of pictures on the subject of the tribes of Famous Native Americans such as the Tlingit nation. The pictures show the clothing, war paint, weapons and decorations of various Native Indian tribes, such as the Tlingit tribe, that can be used as a really useful educational resource for kids and children of all ages. We hope you enjoy watching the video - just click and play - a great social studies homework resource for kids .